We had one the best Easter Sunday’s of all time at EBC! Were you blessed on Easter Sunday? The EBC minstry teams worked together with a sweet spirit and served others with the love of Jesus, during both the 9:00 and 11:00 a.m Easter Sunday services! Each service was exciting and inspiring as we lifted up Jesus our risen Savior in song! The EBC praise team singers blessed our hearts! And the Easter message challenged and encouraged us to celebrate the fact that Jesus totally destroyed death through His resurrection!! The Lord blessed us with 250 in total attendance! And we had several first time guests too! Our outreach, invitations and promotional efforts were blessed of God and fruitful! And, praise the Lord, some received Jesus as their Savior!!! Let’s keep inviting and bringing and being faithful and God will continue to bless us with more fruit! Thank you to all those in the EBC family who served, during the 9:00 or 11:00 a.m. services and those who served during both services! Thank you for helping make Easter great! Thank you to those who teamed up to clean up the church grounds inside and out! Looks great! Thank you to those who served in our nursery! Great job loving our kids! Thank you to those who served during our children’s church! Wonderful job! Thank to those who served on the praise team, and sound and media teams! Terrific job! Thank you to all those who served on the welcome team as ushers, greeters, parking lot workers, and flag and sign ministry! Outstanding welcome and first-time impression! Thank you to those who invited and brought guest and for those who served on the outreach team! You spread the word in a passionate way! Keep it up! I am proud to be a part of the EBC family! We honored God and He blessed on Easter Sunday! Let’s keep being faithful, attending, inviting, and bringing folks, singing, and serving and expect great things! Were you blessed recently at EBC? Just leave a comment and let me know in person this Sunday! I pray this post finds God’s presence guiding you and His provisions meeting your every need! Have you enjoyed our Stewardship Sundays so far? For the past three Sundays we have been inspired to be totally committed stewards of God! God desires that we manage all He has entrusted us with the best way we can. That includes our lives, time, talents, treasures, His truth—the Gospel, and life’s trials. As we have learned God not only has given us the responsibility of stewardship He also has provided us with the supernatural ability and His resources to steward everything well, through the work of Jesus. Commit to follow Jesus all the way and do what He wants you to do, go where He wants you to go, and be who he wants you to be! Commit to pay your tithe (10% of your gross income) to the Lord here at EBC for the work of the ministry! Commit to give your faith promise missions offering. Missions is our responsibility as a church to steward the Gospel of Jesus in our church, community, county, country and beyond. Faith promise missions offerings are given above and in addition to our tithes, for world missions. Missions offerings are used to financially support our missionaries, who have dedicated their lives to spread the Gospel of Jesus in our country (Church planting) and in foreign countries as well. If you have not given your National Church Planting Month offering you can do so this Sunday! Just mark your gift “Church Planting.” You can also tithe and give offerings online at www.ebclife.org. by clicking the “online giving” menu. Help steward the Gospel in our community, by inviting someone to Friend Day on November 5th! You can use the invite card provided in this envelope! Let me encourage you to fill out two commitment cards. Keep one for your personal records and as a reminder of the commitments you have made! Turn the other card in this Sunday as an act of commitment to Jesus and the church. We also use the commitments made to plan our mission’s budget for the next year. So be sure to turn your commitment card in this Sunday! Do you or a family member need to be baptized? We will have baptisms on Sunday night! There will be a brief meeting, after the morning service, for all who are interested in being baptized. Jesus is totally committed to us! He has saved us and has committed to provide all we need to follow Him as faithful stewards. Let’s do our part, by totally committing to be faithful to Him, with all He has entrusted to us! Have you been blessed by the ministries of EBC recently? Please share a comment! Wow what a summer! How did your summer go? Like ours, I am sure you had some ups and downs—some challenges and victories you enjoyed as well! Praise God fall is officially here—at least on the calendar! And as we head into the fall season here are some exciting things to both celebrate and participate in as we live out our faith as the EBC family! Our VBS Summer Event—Operation Arctic: God blessed us with an awesome VBS and VBS Sunday celebration in July! Thank you everyone who dedicated their lives, and time, and love to minister to our kids! Our Awana Kids Ministry Launched in August: our Awana ministry launch was a great success! Thank you to our children’s leaders and workers for investing in our kids! Awana kid’s ministry happens on Wednesday nights from 6:45 – 8:15 p.m.
Our Kids Summer Musical: It was AWESOME to see our kids sing unto the Lord during the Unselfie musical, on September 24th! All of our kids sang out, both the younger and older ones! Thank you to the leaders who worked with the kids! It was such a blessing! Our Senior Ladies Bible Study met this past Wednesday, October 25th: Our senior ladies gathered and enjoyed a sweet time of study, fellowship, and lunch! We had a Men’s Restart Activity: Our men met this past Friday, September 29th, for food, fellowship and solid bible teaching! Twenty men gathered as Dr. Shoemaker taught the Word. Brother Bobby Ray gave a testimony as well. Overall it encouraged and strengthened the faith of the men of EBC! We welcomed 2 newborns to the EBC family: The Blizzard family welcomed baby girl Sadie and the Francis family welcomed baby boy Oliver! We praise God for blessing them with healthy babies! Our Sunday morning services can be viewed through livestream! Now that our livestream has been set up our Sunday morning services can be viewed live on Facebook. Just click on the banner on our Facebook page or our website. ebclife.org. Livestream is an opportunity for those who are out of town, sick, immobile, or otherwise hindered to watch our services live online. It is also a great evangelistic opportunity! Others can also view the service online who may not know Jesus as Savior or have a home church. A recorded video of the preaching during the service will also be available to view on our website, our Facebook page, and our YouTube channel, in case you miss the livestream. We are praying that this new online option will bless our church family and reach others as well! Visit our website, ebclife.org. and click on the media menu to learn more. 2017 Stewardship Sundays! Our 2017 Stewardship Sundays begin this Sunday, October 1st! Each Sunday and Wednesday we will receive practical Bible teaching and preaching that will empower us to steward and manage all we are and have been given by God in our homes and here at EBC! This past Sunday Dr. Charles Shoemaker preached the Word, inspiring us to be faithful to our commitments to Jesus and our church. Visit our website ebclife.org for the full schedule. Fall Ladies Night Out: Ladies, save the date! A fun ladies night out event is coming on October 20th! More information coming soon! Fall Festival—November 4th! We will be having our fall festival on Saturday, November 4th at 5 p.m. at the church. There will be games, good food, and plenty of fun! Please sign up to bring food, help with set-up, and games at the back table at the church! Baskets of Blessing–October 29th through November 12th! Hey EBC family and friends! Let me invite you to help fill our baskets of blessing. This fall we will put Thanksgiving baskets together filled with non-perishable food items so we can bless other families with the love of Christ! Just bring in your non-perishable food items and place them on the table in the fellowship hall. November 12th will be the last Sunday to bring in your items. Friend Day—November 5th! On November 5th at 11:00 a.m. we will have Friend Day—a day where everyone is encouraged to bring at least one person to church with them. Who do you know that needs Jesus, a church home, or both? Be a friend and bring a friend, on Friend Day! We will not have Sunday school on this day. Praise Service and Pie Fellowship–November 19th! We will be having our Thanksgiving praise service on Sunday, November 19th at 6:00 p.m. Following the service, we will also have a pie fellowship. Come and bring your favorite pie to share as we praise our great God and enjoy some great pie! There will be no midweek service on Wednesday, November 22th. How can I be Committed this fall season at EBC? Fall is here! Let me encourage you to be committed church members as you follow Jesus with devotion this fall season! Be present at the services, attend the exciting services and activities, and be ready to take steps in your devotion to Jesus and the church. So what happened on Easter Sunday at EBC? Our church family served with both unity of spirit and anticipation to see God work! All of the prayer, sacrifice, and your sweet and hopeful spirit made Easter Sunday special! God blessed us with guest families! We are grateful for the new families God brought to our church on Easter. They said they received the post card invite and wanted to come and see what we were all about! They did! I am glad that our invite efforts were successful. Let’s pray that they return this week! The Holy Spirit of God worked in and through both the 9 & 11 a.m. services! The music and the message were both encouraging and challenging as we gave witness of the resurrection of Jesus Christ! Both services went smooth as well. The refreshments between the services for our ministry teams were delicious! Our fellowship was uplifting as well! All those serving during the services received a needed boost. Thank you to all who helped with the food and refreshments! Our attendance was solid! We had a total attendance of 290, with returning guests and new families as well! Our Easter offering total: So far, we have received close to $1500 for our Easter offering! Your offering will help to purchase a new projector and enhance our overall worship experience at EBC! If you have not yet given your Easter offering you can give your offering this Sunday or online! Click here to give. A special thank you: Thank you for all those who decided to serve on a ministry team on Easter Sunday! Our welcome team, with all our ushers, greeters, and parking lot workers, our music leaders and singers, nursery and children’s church workers all served Jesus and EBC well! Thank you! Wednesday Adult Bible Study at 7:00 p.m: Tonight, Dr. Shoemaker finishes his study, Spiritual Warfare, with the practical lesson called, “A Strategy for Victory!” Come and bring your kids as we have AWANA kids ministry at 6:45 p.m. and teen ministry at 7:00 p.m. and acquire the Biblical tools you need to win during spiritual warfare. New Sunday Morning Sermon Series, “Purpose Driven Family”! On Sunday, April 23rd, at 11:00 a.m. we begin a new sermon series at EBC! We will see how the right purpose, built on a solid foundation of Jesus, His Word, and healthy relationships, will help our families live out God’s purposes and thrive! This Sunday, Dr. Shoemaker launches this new series with the message called, “Managing conflict in marriage!” Come and see how to deal with and resolve family conflict the Bible way! There is so much to celebrate and be engaged in at EBC! Click here to visit our website. Hope to see you soon! P.S. Have you been blessed by the ministries of EBC lately? Click on “Leave a comment” to share your experience! How is your spring going? Praise the Lord we are experiencing outstanding weather! Spring is a great season for God to bring spiritual renewal and fresh hope to our lives! Why is spring so significant? During the spring season, we celebrate the greatest event in our Christian faith: the resurrection of our Lord and Savior, Jesus Christ. Because Jesus lives we can face tomorrow with hope and spend forever in heaven with Him one day. Easter Sunday is coming at EBC and it’s going to be exciting! We are having two Sunday morning worship services on April 16th: 9 a.m. and 11 a.m.! (There will be no Sunday school or evening service on this day.) You can visit our website here! Decide to be present! Be sure to worship at EBC this Easter. You can have the family dinner at your house and invite and bring your family with you on Easter Sunday. Pray for God to work! Pray that your heart will be open to follow Jesus more than ever before and that God will use you to bless others on Easter. Pray that guests will worship with us during both services: 9 a.m. and 11 a.m.! And pray specifically that God will bring those without Jesus and that they will respond to the Gospel message and be saved, baptized, and added to the EBC family! Bring someone! Use our invite tools to invite and bring guests with you! People are more open to come to church on Easter Sunday than any other time of the year. Give an Easter offering. We have the opportunity to give an Easter offering each year, above our tithes and regular giving, to help grow a specific ministry of the church. Our Easter offering will help purchase a new projector to enhance our media and music ministry! Your Easter envelope is enclosed! Special Instructions: Help make Easter great participating in Operation Move-up! Help us provide the best seating for guests by keeping the back row of seats open and simply moving up one row. Let’s be ready to help others find a seat if need be. You can also park in the grass to help save the best spots for our guests. Expect Great Things! Expect God to work in your life and in the life of your family! Maybe that family member or friend will come to church with you on Easter! It’s possible! You do your part and God will do His! God can also use you to bless someone else on Easter Sunday! Let’s extend a warm welcome to our guests, and church family, and purpose to share the love of Jesus and God will do something awesome! 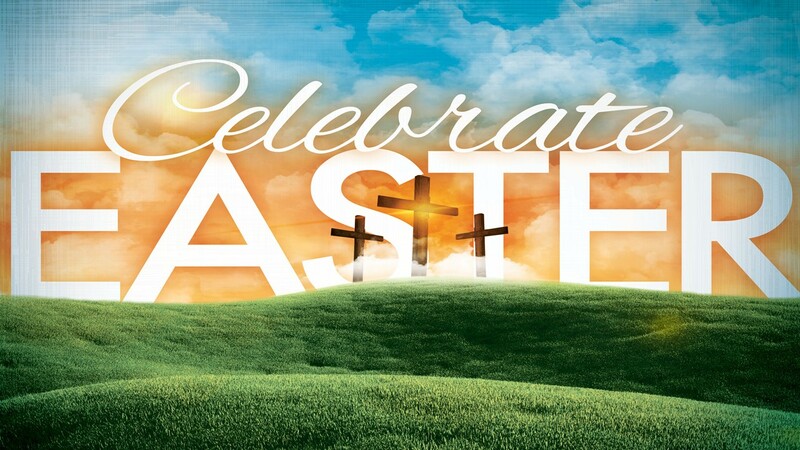 Looking forward to seeing you and your family on Easter! Christmas Holiday Season at EBC! Did you have a great Thanksgiving? Ready or not here we go—go into the Christmas Holiday season that is at EBC! In recent days, I have been sharing some exciting news about our future here together at EBC. And as we continue to get closer to Christmas it’s getting even more exciting! God richly blessed our Stewardship Sundays! Together as a church family we renewed our commitments so our faith, family, and future will be exciting and bright! Our fall festival was a blast! We enjoyed lots of good food, fun, and sweet fellowship! Thanks for all who helped! Our Friend/Thanksgiving Sunday was a blessing! We had some guests join us and we ended the day with our praise and pie fellowship! It was a good time and delicious! Let’s keep inviting and bringing our friends and family to Jesus and our church! We delivered 5 generously filled Thanksgiving baskets to families in need. Thank you to all who helped to fill those baskets! God helped us express the love of Christ! Our future is all about where we are going together and what we will become as we follow Jesus in the days ahead! As we consider the future, and take steps towards our grand vision, we have been answering a very important question: what would God be pleased with us becoming in the next 5, 10, 15, or 20 years, as we pursue Him and His mission of helping more people become growing devoted disciples of Jesus? What will be happening in the next year and next few months? What is happening next? As I lead us to meet both current and future ministry needs here at EBC, we are taking specific steps to help us get there. As I shared in a previous letter, one step was to hire an additional full time staff pastor. Since being hired on November 7th, Jed Carnes, our Family Pastor, is doing very well! Each day he is gaining a greater understanding of how things are functioning in our teen and children’s ministries and making improvements. Jed is also assisting me with important administrative and ministry responsibilities. I also shared that we would be building an education building to meet the needs of our ever-growing children’s ministry and adult ministry as well. Right now, we have no additional, unused classrooms for our children or adult small group ministries (Sunday School or Wednesday). A new building will help meet the current needs of our kids and adult ministries and will enable us to be ready for an exciting future of growth! In recent days, I have assembled an EBC building team. Along with me and the deacons, I asked Manny Giddens, Bobby Ray Crawford, and Ricky Moran to serve with me, and will of course rely on the EBC staff as well. In addition, we have hired two experts to be on the building team: architect, Jason Canning, and Roger Chastain, who is our project manager. Together with God guiding us we are creating our master site plan (a drawing showing how we can use the land God has given us the best way possible) and establishing building phases. Over the next several weeks and months we will also be counting the cost, and creating a tentative building budget. Mark your calendars and plan to attend this very important “no miss” service!! On February 12th, we will have our annual Vision Night Service! On Vision Night 2017 I will be sharing very important details about our future and our building project. You will see a picture of the building we will construct, and the cost. You will also be able to join me in giving pledges above our tithes and offerings to fund our building project! The Auditorium Bible Class Christmas party will be on Saturday, December 10th, from 11:00 – 1:00 p.m. at the Ramondetta home. Please bring a finger food to share. Drinks and desserts will be provided. The Resistance Teen Trip to St Augustine will be on Friday, December 10th. They will be leaving the church at 4:30 p.m. for a fun time of food and fun! Our Kids Christmas program will be on Sunday, December 11th at 6:00 p.m. Be sure to come and invite and bring your family and friends with you. This is a great opportunity for others to hear the Gospel message! On Wednesday, December 14th from 6:45-8:15 p.m. the AWANA children’s ministry will be having their Christmas Celebration. They will also have the AWANA store open that night. The celebration times will be with the individual leader/directors during their large group time. There will be no game time this night due to the AWANA store. Toy Donations valued at $5-$10 are being collected and need to be dropped off no later than Sunday December 11th. The Young At Heart Bible Class Christmas party will be on Friday, December 16th at the Moran’s house at 6:30 p.m. Please bring finger foods to share! We will have our cocoa and cookie fellowship on December 18th following the 6:00 p.m. service. Please bring a plate of cookies to share. Drinks will be provided. We will not have Wednesday night ministry on December 21st and the 28th. Please enjoy this time with your family. Our Christmas Service will be on Sunday, December 25th at 10:30 a.m. We will have a unified service at 10:30 a.m. with no Sunday school, children’s church for grades 1st-6th, and no Sunday evening service. Let’s be sure to invite and bring our friends and family. There will be special Christmas music and a Gospel Christmas message! The Young Adult Bible Class Holiday Party will be on December 30th at 5:00 p.m. at the Nowlen home. If you are currently in this class or are an adult 40 years of age or younger plan to join us for this fun time! Our New Year’s Service will be on Sunday, January 1st at 10:30 a.m. We will have a unified service at 10:30 a.m. with no Sunday school, children’s church for grades 1st-6th, and no Sunday evening service. Come and worship our great God and celebrate the New Year! Christmas time is a great opportunity to express gratitude for who Jesus is and what He has done for us through His birth, life, death, and resurrection through our giving! One way to show that gratitude is by giving a Christmas offering! Last year we were able to upgrade our sound and media computer, to include a new monitor, and an up to date system and software! Thank you to all who gave! This year join me in giving a Christmas offering to help make needed improvements in our teen ministry building. We will be replacing doors, and some of the carpet that has been damaged by weather over the years and will be purchasing some furniture and games for the teens. You can also give towards helping our local nursing home, Wells, receive needed supplies like no skid hospital sox. Or you can give a Christmas offering for our music ministry which will help purchase new wireless microphones. This will enhance the overall worship experience! Just give your offering using the enclosed Christmas envelope or write “Christmas offering” on your giving envelope or check. You can also give your offering on our website, ebclife.org. Just click on the online giving tab. There are great opportunities for us as we celebrate the Christmas season here at EBC! When we decide to pray for our church family and events, be present at the services, and be faithful to do our part God will richly bless! PS: Have you been blessed recently at EBC? Leave your comments! Breaking into the Future at EBC! We are breaking into the future here at EBC! Our Vision Night service was this past Sunday night! It was monumental as we saw a picture of our preferred future as it can and must be! Our vision is what our church is becoming. It is what our church family will look like in the years to come as God blesses and directs us to fulfill His mission. Our vision answers the question, how can we use all that we are and all that we have been given to help bring God the greatest glory and help more people become growing devoted disciples of Jesus in our church, community, country, and beyond? On Vision Night we saw a snapshot of where God is leading us and what He wants us to become in the years ahead! And we were also challenged to help our vision become a reality. Will you do your part? Are you excited to help our vision become a reality at EBC? Let me know by leaving your comment or speaking with me in person! We are ready to celebrate the seasons at EBC! As we head towards the most wonderful time of the year it’s clear to see God is with us! Thank you for being faithful to Jesus and our church. God is working! We had outstanding stewardship Sundays in October! We’re going all the way! We had a really fun fall festival! We had an awesome friend day with 175 in attendance! Thanks for inviting and bringing your friends and family to EBC. Don’t give up! Let’s keep it up! Our ladies of Emmanuel had a great Christmas brunch! We started a new adult Bible class this past Sunday! We have Sunday school classes for all ages at 10:00 a.m.
We had a delicious and wonderful Thanksgiving Sunday! The spirit and attendance were up. The praises were meaningful and the pie was delicious. God is good! We will not have Wednesday night ministry this week. Have a Happy Thanksgiving! Dr. Charles Shoemaker will be our guest speaker this coming Sunday—11/29! There will be a special kids Christmas program practice this Sunday following the morning service until 4:00 p.m.
We are having a Fifth Sunday fellowship at Firehouse Subs after the 6:00 p.m. There are many ways to grow in your relationship with Jesus and with others here at EBC! Let’s praise God for His awesome grace as we continue to worship and serve Him together. Have you been blessed at EBC lately? Leave a comment to share your blessing! God is doing amazing things at EBC! God has been doing some amazing things this fall especially during our Stewardship Sundays! We have been planting and watering and God sure is giving an increase! That’s what stewardship is all about. By the way…have you gone all the way in your commitment to Jesus and your stewardship at EBC or your local church? Our Fall Festival was Awesome: God has been growing our church in so many ways! With 25 new families joining our church family this year and with our attendance growing to about a 130 average on Sundays we had to move the fall festival to the church. And with all the help and effort to plan, set up, run it, and tear down it was a success! What a fun time we all had. And the food and fellowship was great as well. Thank you to all who helped make it great success! God blessed our Commitment Sunday: Commitment Sunday is one of the most important and exciting days for our church family! This past Sunday we were challenged to go all the way in our stewardship by renewing our commitments to Christ and the church. We also celebrated commitment by having baptisms on Sunday night. Praise God 8 people were baptized! What a day God gave us! Wed Adult Bible Study 10/28: Dr. Shoemaker will be our adult Bible teacher on October 28th at 7pm! He will be teaching a practical lesson on “How to Build a Strong Financial House!” Going all the way as good stewards means managing the money God has entrusted to us the best way possible. Come and grow with us tonight! Joint Adult Sunday School 11/1: In preparation to launch our new Adult Sunday School Class on November 15th we will have joint Sunday school class on November 1st and 8th! Come and find out why Sunday school is one of the most powerful vehicles for health and growth in your life and in the church. New Children’s Sunday School Class 11/1: God is growing our Sunday school ministry! This Sunday, November 1 we will begin our new Sunday school class just for three-year-olds. The teacher will be Libby Dunnam. Friend Day is 11/15: Who do you know that needs Jesus, a church home, or both? Be a friend and bring a friend on Friend Day! Thank you for being an important part of EBC or your local church. How have you been blessed recently at EBC? Leave a comment and share your experience! Well the Ramondetta household is hopping since the arrival of our twins Ella and Kate! That’s not abnormal. As you know we have 2 other older daughters who have been keeping us hopping for over 10 years:) Our precious twins (now about 7 months old) are doing great! We thank God and our church family and friends for their love and prayers and meals that were provided as well. Our older girls, Michaela and Sophia, are such a sweet help with the twins as well. We are truly blessed. As our personal family has grown so has our church family! It is amazing how God has increased our church in so many ways! We have added 25 families to our church family so far this year. The spirit is great and we are growing together as a church! But the year isn’t over yet. God still is working and has great things in store for us as we follow Jesus together! The teens had a great trip to the Night of Joy on September 10th! Because of the hard work and your involvement in the teen yard sale fund raiser the teens were able to go to the Night of Joy event in Orlando! Thank you! Our VBS Summer Event was Awesome! We went to Camp Kilimanjaro from July 19th – 23rd and God blessed in a great way! We ministered to over 70 kids and had over 50 workers and leaders come together and serve! Our church family grew together in a big way. And we raised over $840 for missionaries Jim and Adie White to Togo Africa! Our church matched what the kids gave so the offering was $1680! Praise the Lord! The ladies of EBC had a fun Pinterest Activity! On September 24th our ladies came together for some great food, fellowship, a devotion, and some pinning fun! They shared their favorite pin and had crafts too! We are blessed with a great group of ladies at EBC! We had an outstanding Discover EBC orientation Class on October 4th! We had our third class this year and welcomed seven more new families to EBC! (25 new families for the year) We are so thankful for how God is growing our church. Let’s be sure to keep welcoming our new families and help them get acquainted and find their place here at EBC! Learn more about this new member orientation class online at ebclife.org. Stewardship Sundays in October! Our Stewardship Sundays will be during the entire month of October: the 4th, 11th, 18th and 25th. Our theme is “All the Way!” Each Sunday in October we will be inspired to be good and faithful stewards of God right here at EBC! And that means we are going ALL…THE…WAY! Jesus went all the way for us so we are to go all the way in our love, commitment and devotion for Him and for our church! We will have a joint Sunday school class at 10 a.m. (Adults and teens), Sunday 11 a.m. and 6 p.m. services and a Wednesday adult Bible study at 7 p.m. Each Stewardship Sunday is a no miss Sunday! So mark your calendars, pray, and plan to attend each and every service. Children’s Christmas Program Practice—Sunday nights at 6:00 p.m. We are preparing now to have a great kids Christmas program which will be on Sunday, December 13th, at 6 p.m. There will be practice during the Sunday night service. All parents are welcome and encouraged to attend our Sunday evening service at 6 p.m. while the children practice for the Christmas program. Fall Festival—Oct 17th! We will be having our fall festival on Saturday, October 17th at 5 p.m. at the church. There will be games, good food, and plenty of fun! Please sign up to bring food, help with set-up, and games at the back table at the church! Come and help us set-up on Friday October 15th at 4:00 p.m.! Baskets of Blessing—October 25th through November 15th! Hey EBC family and friends! Let me invite you to help fill our baskets of blessing. This fall we will put Thanksgiving baskets together filled with non-perishable food items so we can bless other families with the love of Christ! Just bring in your non-perishable food items and place them on the table in the fellowship hall. November 15th will be the last Sunday to bring in your items. Friend Day—November 15th! On November 15 at 11:00 a.m. we will have friend day—a day where everyone is encouraged to bring at least one person to church with them. Who do you know that needs Jesus, a church home, or both? Be a friend and bring a friend! Ladies Christmas Brunch! Ladies mark your calendars. You are invited to attend a Christmas brunch on Saturday, November 21st at 10:00 a.m. at the church. Praise Service and Pie Fellowship—November 22nd! We will be having our Thanksgiving praise service on Sunday, November 22nd at 6 p.m. Following the service we will also have a pie fellowship. Come and bring your favorite pie to share as we praise our great God and enjoy some great pie! There will be no midweek service on Wednesday, November 25th. God has been working in and through our church in a great way this year so far! As we follow Jesus in a truly devoted way and participate in the activities of the church He will continue to bless and we will grow together upward inward and outward! Don’t miss out on what God is doing here at EBC this fall! Let’s go all the way for Jesus! How has God worked in your life recently at EBC or in your local church family? Leave your comment below!